Millions of American citizens served in the armed forces. So chances are good that one or more of your relatives served at some time or another in the military. If they did, the military kept records about them and their service—and these records can range from okay to amazing! Families do a reasonably good job of passing down information about relatives who served in the Revolutionary War, the Civil War, or the two World Wars. But even if your family has no tradition of military service, it’s still worth checking to see if ancestors who lived during the war periods did in fact serve. It’s possible, too, that an ancestor enlisted in the military during peacetime or that an ancestor who didn’t serve had siblings who did. For all these reasons, there are relatively few American families whose family history research would not benefit from a search of military records. Military records frequently reveal all sorts of information about an ancestor and can help lead you to other sources. Generally, military records fall into three broad categories: 1) pension files and bounty land warrants, 2) service records, and 3) military unit histories. The contents of Military Unit Histories is not covered on a separate page. These records may contain biographies of officers, rosters of soldiers in the unit, and clues to where the soldiers were living when they enlisted. They may also provide dates of death of veterans or their place of residence after their service. It’s best to look in the Author/Title search of the Family History Library Catalog on microfiche under the name of the author if you find that a history exists. Also, go to FamilySearch, click on Search, then click on Research Helps, then click on U (for United States) and get the U.S. Military Records Research Outline. This will give you detailed information and links to film #s.
• General Index to Compiled Military Service Records of Revolutionary War Soldiers. • Compiled Service Records of Soldiers Who Served in the American Army during the Revolutionary War. • Revolutionary War Pension and Bounty Land Warrant Application Files, 1800-1900. • Index to Compiled Service Records of Volunteer Soldiers Who Served during the War of 1812. 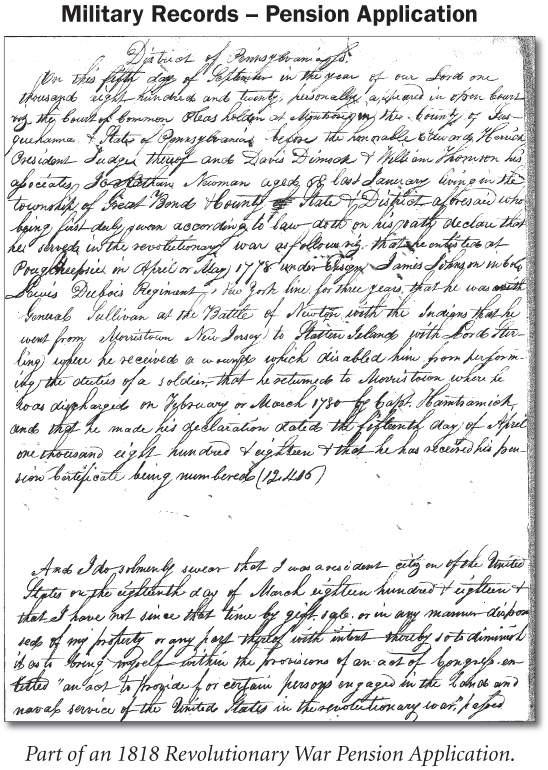 • Index to War of 1812 Pension Application Files. • Index to Compiled Service Records of Volunteer Soldiers Who Served during the Mexican War. • Index to Mexican War Pension files, 1887-1926. • General Index to Pension Files, 1861-1934. Includes the Civil War, Spanish-American War, and Philippine Insurrection but not World War I. • Indexes to Compiled Service Records of Volunteer Union Soldiers Who Served in Organizations from the States (every state except South Carolina had units that served in the Union Army). • Pension Files and Indexes. After the war most Southern states and some border states granted pensions to veterans living within their borders. These are state rather than federal records. • Consolidated Index to Compiled Service Records of Confederate Soldiers. • General Index to Compiled Service Records of Volunteer Soldiers who Served During the War with Spain. • Pensions are indexed in the: General Index to Pension Files, 1861-1934. • Index to Compiled Service Records of Volunteer Soldiers Who Served during the Philippine Insurrection. • Index to Compiled Service Records of Volunteer Soldiers Who Served from 1784 to 1811. • Compiled Service Records of Volunteer Soldiers Who Served from 1784 to 1811. • Index to Indian War Pension Files, 1892-1926. • Index to Compiled Service Records of Volunteer Soldiers Who Served during Indian Wars & Disturbances, 1815-1858. • Registers of Enlistments in the U.S. Army, 1798-1914. • Old War Index to Pension Files, 1815-1926. The National Archives has the federal service, pension, bounty land and draft records. While several major indexes and some collections are on microfilm, most of the original records have not been filmed. These original records are available only at the National Archives. You can obtain photocopies of these records by using NARA Form 85 or NARA Form 86. The general name index and compiled service records for Revolutionary War soldiers are both available on microfilm. The indexes to the War of 1812, early Indian Wars, Mexican War, Spanish-American War, and the Philippine Insurrection are on microfilm, but the compiled military service records for these conflicts are not. Note: In 1973, a fire destroyed 80 percent of the records for Army officers and enlisted men discharged from 1912 to 1959. Note: In 1973, a fire destroyed 75 percent of the records of the Air Force from 1947 to 1963 (surnames Hubbard through Z). To order these records use Standard Form 180. Mail the completed Standard Form 180 to: The National Personnel Records Center, 9700 Page Avenue, St. Louis, Missouri 63132-5100.